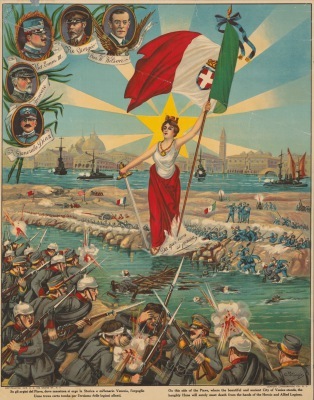 The Project "A Farewell to Arms": Remembering U.S.-Italian Cooperation in World War I directly connects to the spirit of the ‘Great War Remembrance’. 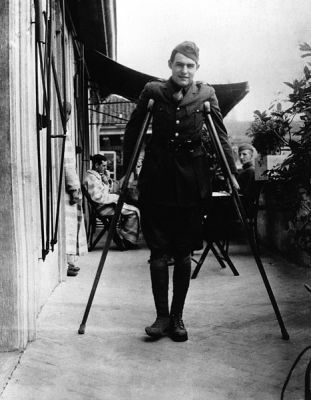 It aims to develop research on U.S.-Italian cooperation; to promote cultural, history-based exchanges; and to foster young generations’ awareness of important historic events that shaped our common history and future leaders such as Fiorello LaGuardia and Ernest Hemingway, despite being known only by contemporary witnesses and WWI historians. The Project will be built upon archival research and will result in a photo exhibition with captions and selected portions of original documents. 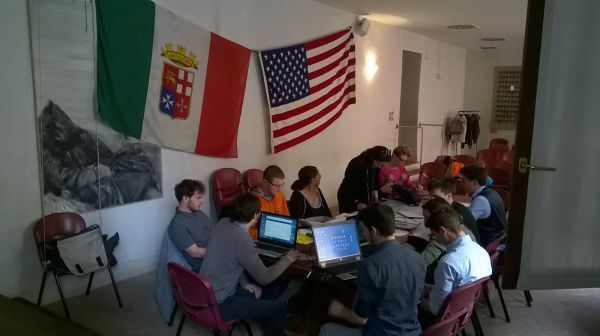 This project has involved high school students (from the Istituto Nautico Venier of Venice and the Aviano High School, DoDEA) who have researched and focused on three major fields: (1) the Navy; (2) the Air Forces; and (3) U.S. humanitarian interventions on Italian battlefields. 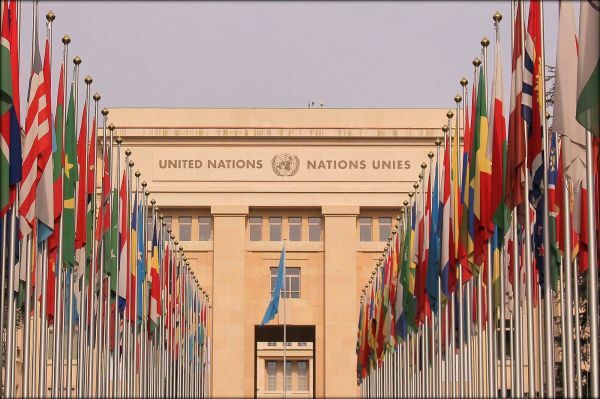 For the Centennial commemoration of WWI (1914-1918), many remembrance projects are being undertaken by various institutions, organizations, and individuals. However, we believe the research method of our Project will constitute a novelty in itself: the research has been carried out by high-school students and will be used for two major exhibits in Washington D.C. and in Vittorio Veneto. 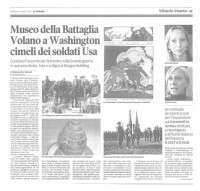 The Museo della Battaglia of Vittorio Veneto and the municipality of Vittorio Veneto will be our major partner for the Washington D.C.'s exhibit providing original objects, pictures, uniforms and flags that will visually support the research of the American contribution in Italy in 1917-1918. Historian Franco Giuseppe Gobbato from the Museo della Battaglia is supervising both exhibits and searching for new material and partners like the Museo Hemingway of Bassano del Grappa who have recently joined the project. American and Italian communities, institutions, and individuals will benefit from the transatlantic perspective of this exhibit. 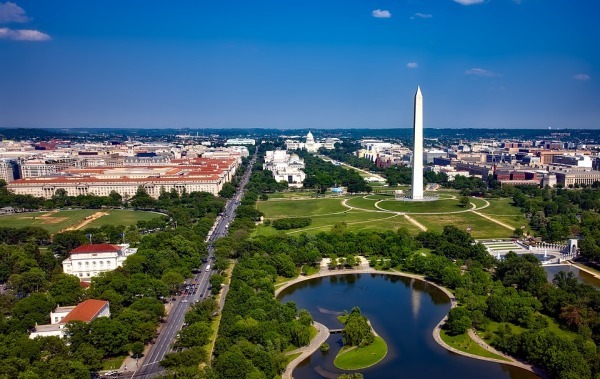 This Project will investigate the widely unknown chapters of shared history between the U.S. and Italy and highlight how common history and shared values have consolidated into an enduring friendship between the people of Italy and the people of the United States. US-Italy Global Affairs Forum Director Donald Jensen is a fellow at the Center for Transatlantic Relations. From 2002-2008 he was Director of Research and Analysis at Radio Free Europe/Radio Liberty, where he oversaw that international news organization’s analytical publications, including the daily RFE/RL Newsline. He also managed the organization’s extensive program of conferences and briefings. Dr. Jensen writes extensively on Russian domestic politics, foreign policy, security and energy issues, especially the politics of Russian business. Dr. Jensen received his B.A. from Columbia University and Master’s and Ph.D. in government from Harvard. 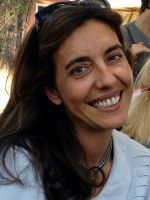 US-Italy Global Affairs Forum Correspondent Susanna Bonini is a journalist and TV producer with over 20 years of professional experience in Italy and abroad. After graduating at the Institut for Political Sciences “Cesare Alferi”, Florence and carrying out research on the comparison of political systems at the Institut d’Etude Politiques de Paris, she obtained a post-graduate degree in Communications, Media and Multimedia at the Institut Francais de Presse. 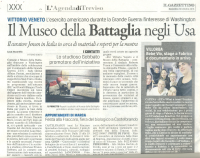 The agreement between Museo della Battaglia, Vittorio Veneto and Us-Italy Forum has been finalized. 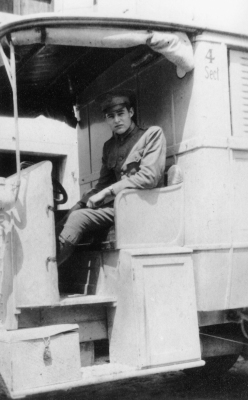 Several pictures, devices, uniforms and mementos from the World War First have been shipped to Washington DC in occasion of the Exhibit happening in November 2017 at the Reagan Building. 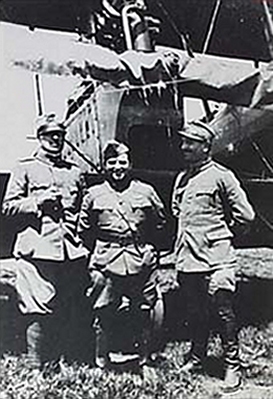 Hundres of artifacts will be showcased for one week at the Exhibit "A Farewell to Arms" dedicated to Hemingway and the Italian front located along the Piave river between 1917 and 1918. Historia Group, Historical and Social studies and Limes Club Pordenone-Udine-Venice have launched for the second year the XXI edition of the Historia Course in Geopolitics. Meetings will be held in Pordenone (February 10-24 and March 10) and in Vittorio Veneto Museo della Battaglia (February 17, March 3-17). Our exhibit collaborators in Vittorio Veneto are going to launch an engaging initiative to commemorate the Centenary of the World War I: the Memorial of the Knights of Vittorio Veneto. 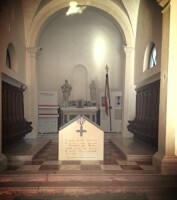 This Memorial is located in the church of St. Paoletto annexed to the Museum of the Battle of Vittorio Veneto and it will be inaugurated on January 21st 2017. It contains ten books which include a list of more than 112,000 names of the knights of Vittorio Veneto who were living among 13 provinces and 1,132 municipalities in Veneto, Friuli Venezia Giulia and Trentino Alto Adige regions. 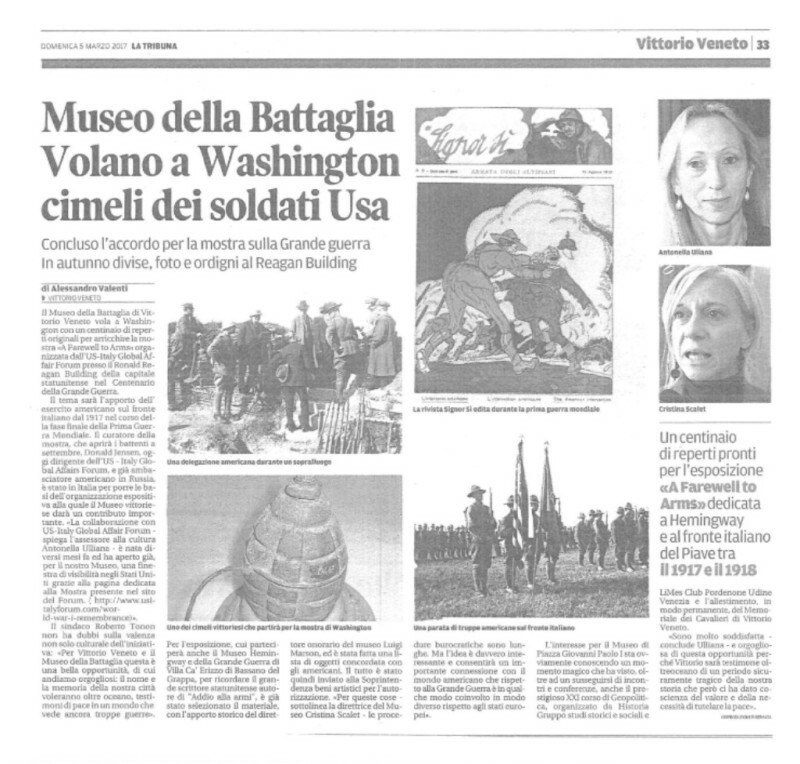 The project was launched one year and a half ago by the author, historical researcher and book curator Franco Giuseppe Gobbato who was immediately supported by the Cultural Council member of Vittorio Veneto Prof. Antonella Uliana and Honorary Director of the Museum of the Battle Ing. 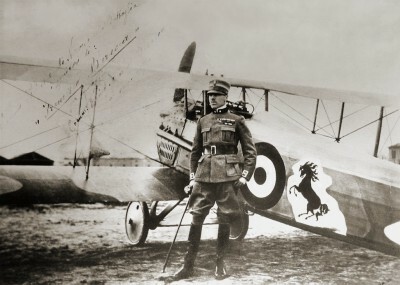 Luigi Marson. 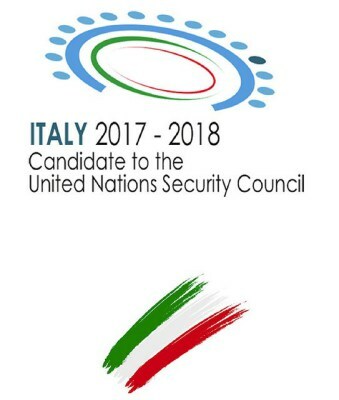 The initiative is unique of its kind in Italy.